Welcome to Christmas in July: Animation Celebration! July is the special time of the year that I turn the blog over to my readers. All month long I'll be posting essays written by people eager to share their passion and memories for animated Christmas entertainments. Today's essay on the much beloved 2004 animated movie Polar Express comes to us from Amanda. Amanda Prok is an 8th grade Writing teacher for the Berea City School District in Berea, OH. She has 14 years of teaching experience. You can learn more about her by following her on twitter @aprok, or checking out her blog at prokteach.blogspot.com. Thanks Amanda! 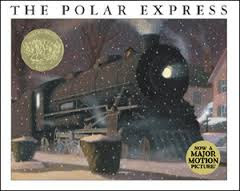 The Polar Express is based on a storybook written by Chris Van Allsburg. The main character is a boy who has reached an age when he begins to doubt in the existence of Santa Claus. The Christmas story takes place late one Christmas Eve, as the boy lies awake waiting to hear the jingling of sleigh bells in the night. Instead, the thunderous sound of a train fills the air and the adventure begins. By the end, no one is left not hearing the sleigh bells of Santa and his reindeer. We’ve all been there, right? Questioning the existence of one of the imaginary characters society, or maybe just parents to help their children behave, have created... The Tooth Fairy, The Easter Bunny, Santa Claus, etc. As I was growing up the Christmas classic, The Polar Express was always one of my favorites. I can recall having the book read to me each year by one of my teachers. My excitement when the movie came out could not be contained and I graced the theater with my presence on opening night. Over the years, after multiple references from me, many have asked, “Why is this Christmas story so important to you?” The answer is simple, this story came out when I was 9 and at the age when I began to doubt the existence of the jolly old man, I’d grown to love. The Polar Express is the story that helped me, all those years ago keep the “true spirit of Christmas in my heart” every Christmas, and all year round, too. The movie The Polar Express followed to a tee the storybook that I came to love as a child 19 years before. What Christmas is all about is represented well in the movie, however, the absolute best part is when Santa gives the young boy a chance to pick “the first gift of Christmas.” A brilliant bit of writing and cinematography the boy, realizing that he can pick anything in the world, chooses the simple silver bell he longed to hear, and finally hears once again. Yet, we as an audience, are left wondering with great anticipation what the boy has chosen. And then Santa Claus stands and announces “The first gift of Christmaaaaaaas!” as he holds up the silver bell, the camera pans out and the audience is left seeing the magnificent Christmas tree in the center of the massive crowd. This heart-warming movie is a must watch every Christmas and has led me to keep a little piece of it displayed year round in my living room. At this point, who is left not being able to hear that bell ring? I have to admit, I myself am not a big fan of The Polar Express, but appreciated hearing the impact it had on Amanda. I agree when she says we've all been at that crossroad as children where we are discovering the truth about some of our favorite Holiday characters, but there is a way to keep the spirit of joy and innocence alive even as we grow older. I am glad she found that in this movie and book and that it has become a constant reminder to listen for the bell! Amanda - thank you for your great review! It took me some time to become a fan of The Polar Express, but I really do enjoy seeing it each holiday season. The animation is fantastic in its own way (very different from a traditional animated film or special), plus the music is very enjoyable. I was recently asked to read this book to several groups of children for a local school's literacy program. I couldn't make it though to the end without getting all choked up! LOL. I'm glad I'm not the only one who finds this story meaningful.